With glamping (or glamourous camping) becoming an increasingly popular choice with holidaymakers wanting to enjoy the great outdoors, but with more than just a touch of luxury, we’ve decided to offer visitors the chance to experience the tranquillity and beauty of the Norfolk countryside in lovingly built, traditional East Anglian shepherd’s huts. This year, we’re launching glamping with two shepherd’s huts now installed on site. 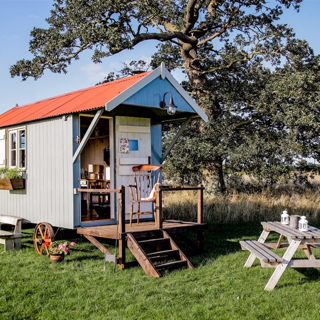 Each shepherd’s hut features a double bed, log burning stove and power and is decorated in a cosy country style, bringing a touch of glamping luxury under the big skies of the Norfolk countryside. We’re really excited about having the glamping option here on the farm. The huts really are a special place from which to spend a few days exploring the Norfolk countryside and what’s more, there is a family connection with the huts too, as they have been hand built by second cousin Andrew. The Farm sits on 250 acres, where we grow mixed arable crops, grassland and have a prize-winning herd of pedigree Hereford cattle, which of course, are maintained to the highest standards of animal welfare and stewardship. An intensive programme of planting for wildlife has been undertaken all around the farm with miles of hedgerows, new woodlands and hundreds of native trees planted. Field margins have been established with wild flowers to attract insects, especially pollinators like bees and butterflies. All this means we’re positively surrounded by countryside filled with native wildlife, walks, pubs and cycle routes, making it the perfect base from which to explore the Norfolk countryside. Weather it’s a weekend break from the city, a pitstop on a cycle tour, walking holiday or you just want a place to connect with nature, the peace and quiet here takes a lot of beating.